The DFAB House, currently under construction in Dübendorf, Switzerland, showcases five digital building methods that have never before been seen in architecture, and the concrete Smart Slab is the latest addition. The structure has been computationally designed to use only the minimal amount of material necessary to make it load-bearing, and is less than half the weight of usual concrete slabs. 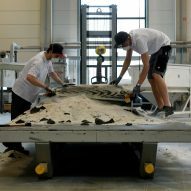 The light weight form was enabled by using 3D sand printing to make the slab's underlying formwork. With 3D printing, highly complex structures are as easy to produce as a solid block — meaning extraneous material can be cut out of a design before it is sent to the printer. 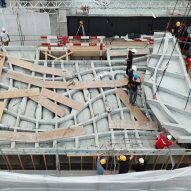 ETH Zurich hopes the innovation will draw the construction industry away from producing "the same solid ceilings over and over again". "The disadvantage [of traditional formwork production] is excessive material consumption and implicitly, a big carbon footprint," said ETH Zurich. "Digital fabrication methods can make a key contribution here: components can be optimised, enabling the necessary stability with far less material." "The geometric complexity of a component does not matter in 3D printing, nor does it cause any additional costs — the printer simply prints what it is told to." The Smart Slab covers 80 square metres between the ground and first floors of the DFAB House. In total it weighs 15 tonnes, and its ornamental, undulating design is just 20 millimetres at its thinnest point. It was developed by a research group led by architect Benjamin Dillenburger, an assistant professor in Digital Building Technologies at ETH Zurich. Working together with industry partners, the group used a 3D sand printer to produce the folding, dune-like formwork. The material is like an artificial sandstone, with fibre-reinforced concrete sprayed over the top. 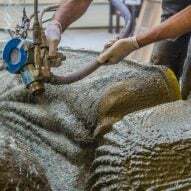 While concrete can be directly 3D printed — and has been in structures like BAM Infra and Eindhoven University of Technology's cycling bridge — a key advantage of the hybrid process is that it allows for the use of this high-performance fibre-reinforced concrete. 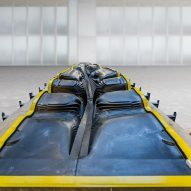 ETH Zurich describes the slab as combining "the structural strength of concrete with the design freedom of 3D printing". A secondary formwork made using a more traditional mould of CNC-cut timber created an overarching grid for the structure. The research group designed both formworks using a custom software that not only adapted the shape to be as thin as possible but also coordinated the best size and positioning for lighting and sprinkler systems. "We didn't draw the slab; we programmed it," said architect Mania Aghaei Meibodi, a Smart Slab project lead. "It would not have been possible to coordinate all these aspects with analogue planning, particularly with such precision." While ETH Zurich said this saves only a few centimetres in the DFAB House, it speculates that in a high-rise, it could mean fitting in a few extra floors. The DFAB House has been in the works since 2017, when ETH Zurich announced it would design and build the three-storey residence at NEST – a modular research and innovation building operated by the Empa institute for material science and technology development and the Eawag aquatic research organisation. 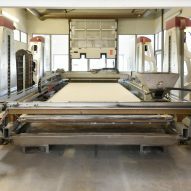 It is part of the National Centre of Competence in Research (NCCR) Digital Fabrication project. Another technology used at the site is Spatial Timber Assemblies, where wood house frames are assembled by robots that can work fast without colliding.